If you’re looking for a deck builder to complete a decking project at your home in Columbia, Illinois, it is worth doing research to protect your investment and ensure you select a company that will do the job properly. Fortunately, you don’t need to search for long because you’ve found Chesley Fence & Deck. We have been a custom deck builder serving residents throughout the region since 1967, and our long-standing A+ rating with the Better Business Bureau is proof of our unwavering commitment to our customers’ satisfaction. Wood decking – We offer cost-effective treated lumber decking that is durable and can be stained or painted to our customers’ liking. We also offer premium cedar with enhanced resistance to warping and cracking. Composite decking – We offer several composite options to suit our customers’ preferences and budgets. However, we typically recommend our Tamko EverGrain® Envision® PVC coated composite because it has exceptional durability as well as superior resistance to staining and deterioration. 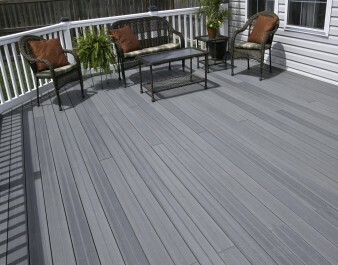 This decking is even backed by a 20-year warranty. If you’d like to learn more about why Chesley Fence & Deck is the premier deck builder serving Columbia, IL, and the surrounding areas, contact us today.